Prescription drugs are a major driver of healthcare costs for individuals in general, and for employers specifically. Prices increase an average of 4% a year and specialty drugs, already the most expensive category, increase by 21% per year. Politicians across the political spectrum have put drug costs at the center of their healthcare rhetoric, but little action has actually been taken. In the meantime, prescription drugs have become the second greatest healthcare expense for companies and represent roughly a third of total healthcare costs for employers. The number one thing you can do to reduce prescription expenses is to make sure that your employees are well informed about their coverage, prescription options, and best practices. Education is free, for the most part, and will not only reduce costs but will also make employees feel better about their benefits packages. Many employees feel that their companies do not sufficiently explain their benefits and coverage, so they will appreciate any effort to provide them with more information. Most importantly, educate your employees about best practices that will save themselves and, by extension, the company money. This includes telling them about preferred pharmacies, generic alternatives, mail-order services, and other cost-saving options. Healthcare costs are a major source of stress for employees as well as employers, so telling employees what they can do to cut costs will often be enough to cut your expenses significantly. You should also make sure that your employees understand their coverage and the tools that are available to them. In the next few sections we will explore various structures and tools you can use to reduce costs. However, they will only be effective if employees use them, so education is still key. Every communication regarding healthcare and reducing prescription drug costs should be framed in the context of the benefit to the employee. Hopefully all of the best practices and all of your policies will help your employees as well as the company – so make that the heart of your messaging. This can turn a potential morale crisis into a boost in employee engagement. Your employees will appreciate your efforts to give them the knowledge and tools they need to manage their healthcare and save themselves money – and may not even consider the possibility that you are also trying to save the company money. While education is vital, it is often not enough. You need to provide your employees with tools and resources to help them keep the cost of care low. Best of all, these tools can be presented as new benefits, making your employees feel valued and appreciated. An easy tool to implement is a prescription savings card such as Clever RX. Here at Launchways, we partner with Clever RX to help improve the benefits experience for our client’s employees. Clever RX cards offer increased savings at pharmacies and work in conjunction with most insurance. Users save up to 80% on prescription drug costs and generally pay less than most copays. More than two thirds of people can save money with a prescription savings card, especially during an era of rising deductibles. In addition to giving your employees a prescription savings card, you can also offer them a comprehensive healthcare planning tool like HealthiestYou. Launchways partners with HealthiestYou to offer our client’s employees access to quality healthcare services at a fraction of the cost of traditional healthcare channels. Using HealthiestYou, employees can search for nearby pharmacies and in-network providers and easily compare the prices of copays/deductibles at each option to reduce costs. They also receive regular reminders about benefits and savings, and can review their coverage information at any time through the app, making your job of educating your employees that much easier. Perhaps the greatest benefit of HealthiestYou is their telemedicine platform. With telemedicine, employees have 24/7 access to teleconference appointments with board-certified doctors. With telemedicine, employees can receive prescriptions for common health concerns with a simple phone or video call. HealthiestYou and other apps can save your employees and your company time, money, and stress. The last way to reduce healthcare costs across the board by empowering employees is to offer preventative benefits. If you encourage healthy employee lifestyles, you can avoid many costs from medical visits and prescription drugs. An Employee Assistance Program offers confidential third-party guidance to employees to reduce their stress, help them cope with their struggles, and hopefully keep them out of medical harm. More importantly, wellness programs can reduce “lifestyle diseases”, a major cause of medical costs in the US. Fitness competitions, standing desk options, and access to gyms or nutritionists either onsite or at a reduced cost can help keep your employees healthy and off of prescription medications. While restrictions should be avoided whenever possible, as we will explore in the next section, you can provide incentives to push employees towards prescription drug best practices. There are a few key incentives that are effective and not overly burdensome. First, you can create additional tiers of insurance to enable employees opt-in for greater coverage. This can increase cost-sharing significantly, and offering increased care is an easy sell even if it is at a higher cost. In particular, consider creating a tier that covers specialty medications. Specialty drugs represent 38% of prescription costs but only 1-2% of total prescriptions, so focusing on them can often be the most effective way of reducing expenses. Drug formularies offer another powerful incentive to keep the cost of prescriptions down. They are essentially lists of drugs that are eligible for increased coverage and available at lower cost to the employee. You can work with your insurance provider and pharmacy benefits manager to put together formularies that best meet the needs of your employees and your company. Formularies are effective because they do not reduce coverage so much as they encourage intelligent decisions by offering additional incentives for generics and other cost-effective drugs. Many common cost-cutting methods punish employees, shift costs from the employer to the employee, or reduce the level of care. 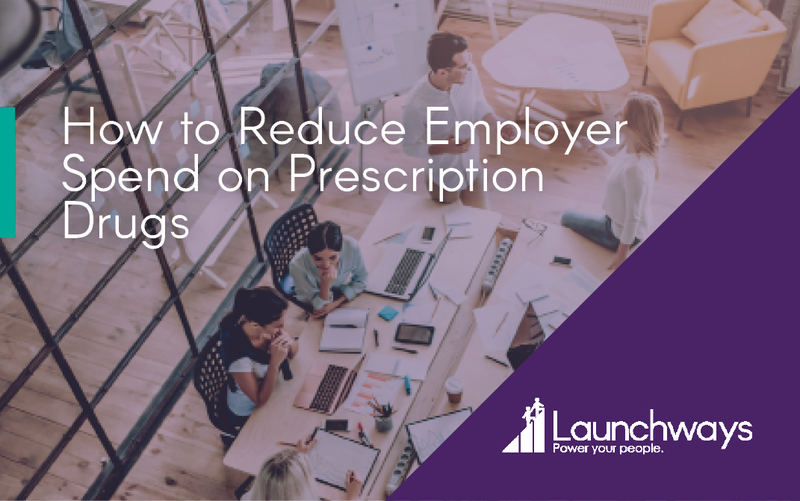 When there are so many ways to reduce prescription drug expenses that actually benefit employees, restrictions should be avoided whenever possible as they can cause harm, or at least inconvenience, to employees and damage employee trust in your company. Even the perception that you are cutting coverage can cause morale to plummet, driving poor performance and high turnover as employees look for a company that they believe will provide greater benefits. This is why it is important to emphasize the benefit to the employee throughout the healthcare conversation, and avoid policies that genuinely reduce coverage. One of the most effective ways to cut prescription expenses is to work with a Pharmacy Benefit Management company, or a PBM. These organizations negotiate with pharmacies, drug companies, and health insurance providers to secure rebates for specific drugs and keep costs low for their clients. Currently, 65% of companies use a PBM to reduce their healthcare costs. If you are not one of those companies, then you should look into how a PBM can save you money on prescription drugs. But if you already work with a PBM, you can increase your savings by putting your relationship under the microscope. The first thing to keep in mind is that you should never sign a long contract with a given PBM and you should retain the right to renegotiate the contract at any time. This keeps them on their toes and ensures that they will continue to work to get you new savings. It also empowers you to take matters into your own hands to correct any abuse by the PBM. Once you have secured the ability to monitor and correct PBM behavior, you need to actively manage your relationship. Examine your contracts regularly and renegotiate whenever possible to make sure that the needs of your company and your employees are being met in a cost effective manner. Also, do not be afraid to research current trends and price compare with other PBMs to make sure that your relationship still makes financial sense. In an age of rising drug prices, and higher co-pays and deductibles, many employers are cutting coverage to manage their costs. But the reality is that you can effectively reduce costs while helping your employees receive the highest level of healthcare. Another open enrollment period has come and gone. Hopefully this stressful time of year went smoothly for your HR department and for your employees, but chances are your team is frazzled and your employees still have questions about the plans they signed up for. No matter how well you handled open enrollment, there are probably steps you can take to make things go better next year. Why is it so important to get open enrollment right? Well, according to Aflac surveys, 80% of employees believe that their benefits package influences their engagement in their jobs and with their companies. Moreover, a majority of employees surveyed said that they were likely to accept a job with lower compensation but better benefits. Therefore, it is vital that you make sure that employees have access to their benefits, are fully informed about the range of benefits available to them, and feel positive about every part of the benefits enrollment process. So how can you make next year’s open enrollment period more satisfying and less painful for everyone involved? All the answers you need are in the open enrollment period you just survived. Take a hard look at the past enrollment period to figure out what went well, what didn’t go so well, and what you can do to handle open enrollment more effectively next year. The first step to figuring out what to do next year is finding out exactly what happened this year. Hopefully you collected useful information during open enrollment, such as employee enrollment rates or the number of emails, meetings, one-on-one sessions, and calls between employees and internal stakeholders regarding the benefits options. 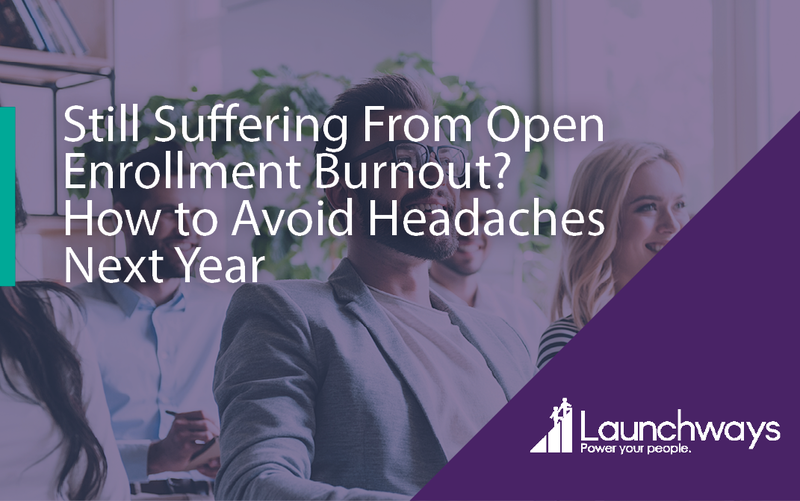 What’s important to do now that the enrollment period is over, though, is to find out what employees and internal stakeholders thought of the process in order to identify pain points and preferences. Once you have collected enough data, it is time to analyze it to draw inferences that will allow you to plan for next year. You should look for trends in survey responses that indicate either successes or challenges during the enrollment period. Behind each trend is a behavior or set of behaviors that drove the end result for your employees or stakeholders. In many cases the good or bad behaviors and processes will become evident as soon as you identify the trends, others may require further interviews with troubled survey respondents to identify. The same trends can also have different behaviors behind them that will become clear upon further investigation. Take, for instance, the example of employee dissatisfaction with benefit options. You have a serious issue when a lot of employees are not happy with the benefits offered to them, since benefits are key to employee performance and retention. In some cases, your benefits package may need to be reviewed and expanded. Most of the time, however, employees’ dissatisfaction stems from not being clearly informed of the full range of options available to them. Taking the time to explain the options and how they provide for employee needs can nip this issue in the bud. Enrollment process – did employees enroll on paper or online? For each behavior that you identify in the previous step, you should create actionable next steps to improve the enrollment process next year. Think about how you can prevent the issues that came up this year, what new practices you can establish to make the process easier, and how you can preserve existing positive behaviors so that they do not get lost over time. You shouldn’t put off implementing new best practices until next enrollment period. 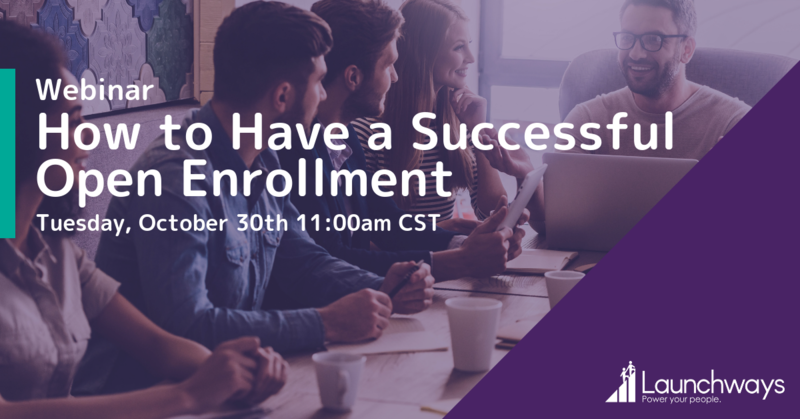 Make a game plan for how you can prepare for open enrollment over the course of the entire year. Set quarterly and monthly goals and keep yourself, and your team, accountable to that schedule. Let’s continue the trend/behavior example from the previous section and look at some actionable next steps you can take to address employee dissatisfaction with benefit options. The first step you can take is to follow-up with survey respondents to find out exactly what they thought was lacking in the benefits package. If it turns out that the options actually include many of the things that they want, then you know you have a communications issue. So, create a plan for how you can address the issue over the time from now until open enrollment closes. This might include a monthly newsletter featuring benefits options, establishing one-on-one meetings with each employee to determine their needs and find the plans that meet those needs, or creating a new benefits handbook. Each company’s challenges are unique, but there are some things that most people can do to make open enrollment as productive and pain-free as possible. Take the opportunity to highlight your benefits package and boost employee engagement by providing clear and positive information about benefits options. Create easy to digest reference materials, make the HR team and insurance brokers as accessible to employees as possible, and hold open meetings explaining benefits year-round. Also, make sure that your managers have the information they will need well ahead of time, because their team members will come to them with questions as soon as open enrollment starts. Track as many metrics as possible in real-time during open enrollment next year, so that you can correct issues immediately and minimize post-enrollment follow-up. You should examine your benefits processes every year, but try to make your job easier next year so that you do not have to do as much data collection. Also, set up clear communication procedures and do not deviate from them. That way employees know where and how to get more information about their benefits options and you can avoid costly mixed messages and wasted time. Keep your team members happy by making ACA compliance as painless as possible. The best way to do this is to take a look at how you document coverage offers. If you don’t have a standardized, streamlined, and electronic way of tracking coverage offers, it’s time to investigate different software options. Record keeping is a pain, there is no reason to make your team’s job harder. Also, make a plan for when you are going to send employees information necessary for compliance, such as the Summary of Benefits and Coverage and the Uniform Glossary. The more formalized the process is, the less likely you are to let something slip through the cracks. Even if you have your open enrollment procedures down, there are probably things you could do year round to make your lives easier come enrollment time and provide employees with more information, more regularly. The best way to do this is to send a benefits newsletter every month or quarter, or to regular email updates on benefit options and policy changes. This way, employees will have access to more information when the time comes to choose their benefits, without being overloaded with information all at once. The sad truth is that the majority of employees spend less than an hour reading about available plans and choosing their benefits. So, giving them information in more manageable pieces throughout the year can help prepare them more effectively than providing more information than they will use at the start of open enrollment. Sending regular updates can also make your internal stakeholders’ jobs easier too. 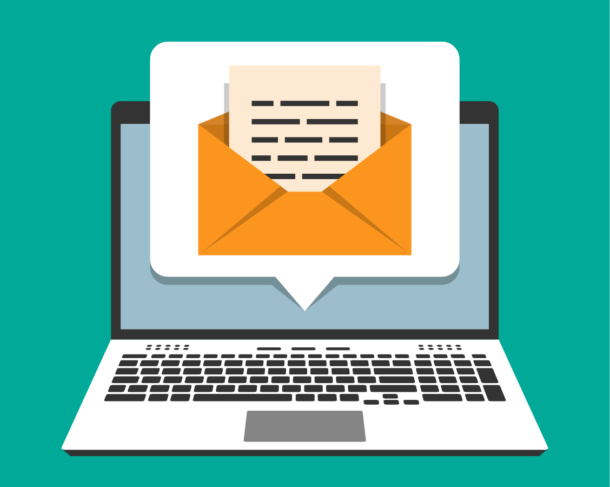 It can be hard to record all of the policy changes that occurred over the past year; newsletters give you a reason to record the changes over the course of the year rather than all at once when open enrollment is approaching. The newsletters or emails will also become valuable resources for your team to direct employees to in order to answer common questions. What practices has your company implemented to make open enrollment easier and more successful? Share your tips in the comments below. Healthcare costs are rising with an 8% increase year over year. One innovative method employers are using to control costs while improving healthcare delivery is telemedicine. Telemedicine is an emerging technology field which facilitates two-way digital communications between patients and doctors. While a few years ago telemedicine was hardly on the radar of most businesses, it has become increasingly prevent in modern companies. Since 2015, there has been a 26% increase in employers who offer these services. And according to the Mercer National Survey of Employer-Sponsored Health Plans, almost 60% of America’s large employers currently provide telemedicine. What are the benefits of telehealth services? Telemedicine, also known as telehealth, can be defined as electronic two-way real-time communication between a medical professional and a patient. This communication might happen over a phone call, video call, or even a mobile chat. With telehealth services, your employees can speak with a medical professional on-demand via computer, phone, tablet, or a digital app on a mobile phone. Telehealth is simple to roll-out and even easier for your team to being taking advantage of. Through a mobile or desktop telemedicine app, an employee initiates an appointment. The employee can select a phone call or video call. The telehealth app then directly connects the employee with a board-certified doctor. The doctors collects the necessary information, makes a diagnosis, and overviews next steps for the patient’s treatment. All the medical professionals employees access through telemedicine are board-certified doctors and are fully licensed to prescribe treatment and medications directly through the app. Reduced healthcare costs for employees and employers. Unnecessary doctor and ER visits cost both employers and employees millions of dollars a year. In fact, studies show that almost 75% of all doctor, urgent care, and ER visits are either unnecessary or could be handled safely via telehealth. Research estimates that telemedicine could potentially deliver more than $6 billion a year in healthcare savings to U.S. companies. The estimated return on investment for a telemedicine program was about $3.30 in cost savings for every $1 spent on program implementation, according to the Geisinger Health Plan study. Reduced absenteeism. Employees frequently miss work for doctors appointments or illness. Telehealth helps combat this by providing 24/7 access to doctors, on-demand. In many cases, telemedicine eliminates the need for in-person office visits for simple ailments like the flu, ear infections, and sinusitis. In one survey, 21% of patients said not having to travel to the doctor’s visit was the top benefit of telemedicine. Happier employees. Research shows that employees highly-value access to a telemedicine solution. A recent survey found that of those who have experienced real-time telehealth communication with a mobile app, 80% prefer this method to a traditional in-office medical visit. Empowered employees. Telehealth services help empower employees to take charge of their health. In one study, 53% of patients felt that telemedicine increased their involvement in treatment decisions. Healthier employees. As with any healthcare benefit, better health outcomes are the ultimate goal. Significant research has been done to determine telehealth’s effect on patient outcomes. A study on the Geisinger Health Plan, found that patient readmissions were 44% lower over 30 days and 38% lower over 90 days for patients enrolled in a telemedicine program. Many healthcare providers are now including a telehealth program along with their healthcare network. Another option is to roll-out a dedicated telemedicine program through a telehealth app provider, such as HealthiestYou. In most cases, a dedicated telehealth provider has better technology and much higher employee utilization rates than the telehealth features rolled into provider plans. The right benefits broker can help you analyze your existing healthcare offering and determine the best plan to integrate telehealth services. 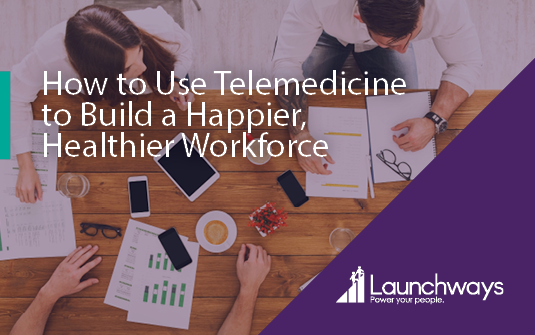 Here at Launchways, we partner with Teledoc, HealthiestYou, and Best Doctors to help our clients roll-out high-impact telemedicine programs. Is your team using telemedicine? If not, do you plan to roll out a telehealth program this year? Let me know in the comments below.